Did you know if your vehicle check engine light is on you will fail the emission test, even if nothing major is wrong. Get your car emissions ready. Discount Brake Tune and Lube have computers that will tell us why your check engine light is on. We will diagnose the problem and fix it to get your car emission test ready. Under Arizona law, all vehicles manufactured in 1967 or later are required to meet certain emissions standards designed to preserve Arizona’s air quality. 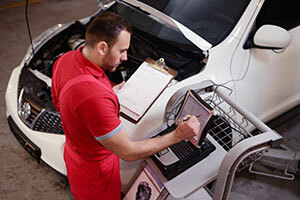 At Discount Brake Tune and Lube, an authorized Napa AutoCare Center, our technicians are well-versed in the modern techniques and diagnostic tools needed to meet the needs of today’s emission standards. We can also counsel you as to whether your vehicle fits into one of Arizona’s categories of “exempt” vehicles, meaning no emissions testing is needed. If your vehicle failed the emissions test Discount Brake Tune and Lube, Phoenix car repair shop, can help you diagnose the problem and fix it. Failing emissions is annoying, but we make the repair process a little easier. Our car repair service is quick and affordable. Let’s face it, car repairs are never fun, however Discount Brake Tune and Lube, an authorized NAPA AutoCare Center is dedicated to fixing your car, getting it emissions test ready and making you a lifelong customer. At Napa Auto Care Center, we are proud to serve Phoenix and surrounding areas, and look forward to working with you on your next emissions and diagnostic test or service. For an appointment, contact our auto shop at (602) 667-3400 today. If you would like to visit Discount Brake Tune and Lube, our Casa Grande location, call (520) 426-1500.